WASHINGTON, Jan 27 2015 (IPS) - India garnered international attention this week for its climate action. As President Barack Obama visited the country at Prime Minister Narendra Modi’s invitation, the two leaders announced a new U.S.-India agreement on clean energy and climate change. With the U.S.-India partnership, the world’s three-largest emitters—China, the United States and India—have all made strong commitments to curbing climate change and scaling up clean energy. The agreement will help turn India’s bold renewable energy targets into reality. Rather than relying on one major plank, the collaboration is a comprehensive set of actions that, taken together, represent a substantial step in advancing low-carbon development in India while also promoting economic growth and expanding energy access. This agreement comes just two months after the U.S-China climate agreement. While expectations for the two agreements were quite different — India’s per capita emissions are a fraction of those from China and the United States, and India is in a very different phase of economic development— Modi’s commitments are significant steps that will help build even further momentum for a new international climate agreement. Prime Minister Modi’s new government has made a significant commitment to sustainable growth in the past several months, setting a goal of 100 gigawatts (GW) of solar power capacity by 2022 and considering a new target of 60 GW in wind energy capacity. The Indian government has also created a new initiative to develop 100 “smart cities” across the country, aimed at building more sustainable, livable urban areas. Building on India’s 100 GW solar capacity goal, Modi announced India’s intention to increase the overall share of renewable energy in the nation’s electricity supply. Setting a percentage of overall energy consumption that will come from renewables can not only help India reduce emissions, it can also play a key role in expanding energy access. Roughly 300 million Indians—nearly 25 percent of the country’s population—lack access to electricity. Solar power—which is already cheaper than diesel in some parts of the country and may soon be as cheap as conventional energy—can put affordable, clean power within reach. Given that the entire world’s installed solar capacity in 2013 was 140 GW, India’s plan to reach 100 GW by 2022 is nothing short of ambitious. The Modi government estimates that scaling up its 2022 solar target from 20 GW to 100 GW will save 165 million tonnes of carbon dioxide a year, the equivalent emissions of about 23 million American households’ annual electricity use. The U.S.-India announcement reveals a clear commitment from both countries to stimulate the public and private investment needed to achieve this bold target. Of the 20 cities with the worst air pollution, India houses 13 of them. The cost of premature deaths from air pollution in the country is already 6 percent of GDP, and it’s poised to worsen as the urban population increases from 380 million to 600 million over the next 15 years. The U.S.-India plan to work with the U.S. Environmental Protection Agency’s AIR Now-International Program can help cut back on harmful urban air pollution, improve human health and reduce greenhouse gas emissions. Modi’s plan to establish 100 “smart cities” can support this initiative by designing compact and connected rather than sprawled urban areas, which are associated with a heavy transportation-related emissions footprint. India is already one of the countries most vulnerable to climate change: rising sea level threatens 8,000 kilometers of coastline and nearly half of its 28 states. The U.S.-India deal builds on both countries’ previous commitment to climate adaptation, outlining a plan to better assess risks, build capacity and engage local communities. This action is not only important for reducing emissions in the three nations, but also for building momentum internationally. 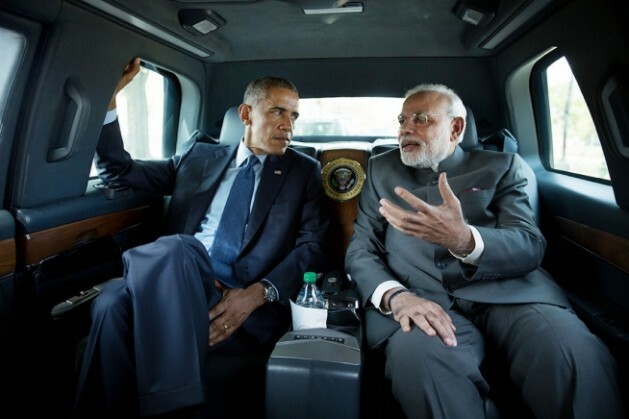 Obama and Modi have created a direct line of communication, a relationship that will be important for securing a strong international climate agreement in Paris later this year. Prime Minister Modi made it clear that he sees it as incumbent on all countries to take action on climate change. Modi is tasked with confronting not just global warming, but a number of immediate threats—alleviating poverty, improving air quality, expanding electricity access and enhancing agricultural productivity, just to name a few. Many of the actions under the U.S.-India agreement will not only reduce emissions, but will also help address these development challenges. With the new agreement, India is positioning itself as a global leader on pairing climate action with economic development. This is a total fluff piece. No mention of India’s plans to ramp up coal-fired power? Fast-tracking nuclear? IPS readers deserve more critical thinking.